Ross, 33, has mostly retired from modeling and most recently appeared in "Snow White and the Huntsman" as Stewart's mother. While Kristen Stewart promoted a new film in Toronto, her one-time romantic rival took to the runway. 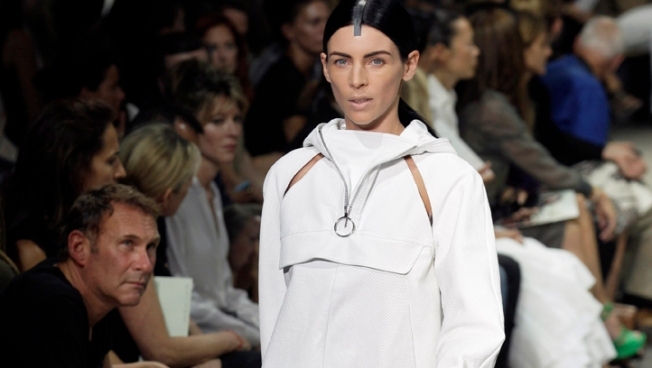 Liberty Ross, the wife of "Snow White and the Huntsman" director Rupert Sanders, walked the catwalk during the Alexander Wang show on Saturday at New York Fashion Week wearing a white wind-breaker with a pencil skirt. Stewart and Sanders issued public apologies following tabloid reports they had a brief affair while Stewart was dating her "Twilight" co-star Robert Pattinson. Stewart appeared in public for the first time since the scandal broke on Thursday for the premiere of "On the Road" at the Toronto International Film Festival. Hundreds of "Twilight" fans came out to show support for the 22-year-old actress. Meanwhile, Alexander Wang's show is one of the hottest tickets at fashion week and he's made a splash before using models who aren't regular runway walkers. Last season it was Gisele Bundchen, Shalom Harlow and Karolina Kurkova. On Saturday, runway graduate Erin Wasson also returned to his catwalk.